Model BX 2822D NEW Size : 22.5" Tall interior for easy loading ! Tons of power for easy cone 10 firing. Still has patented lid system, double wall, and floor element. 6 elements and 3 thermocouples means that the kiln can be built 3 phase still if necessary. The Cone Art BX2822D will easily fire to cone 10. 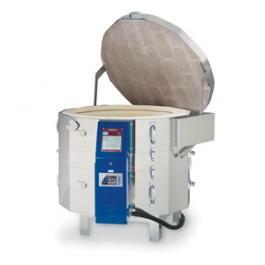 With a 28” interior diameter this kiln is suited for 26” diameter shelves, and just like the BX2322D is a little easier to reach the bottom than with standard depth kilns. 3 thermocouples and our double wall construction results in energy efficiency, and our standard element in the floor helps to ensure even firings every time. Just like the deeper models, this kiln easily disassembles into 3 sections for easy delivery. Combining our patented lid lifter with the 22.5” depth make this an ideal production kiln for baby boomers. The kiln is big enough to hold a large load while being easy on your back.